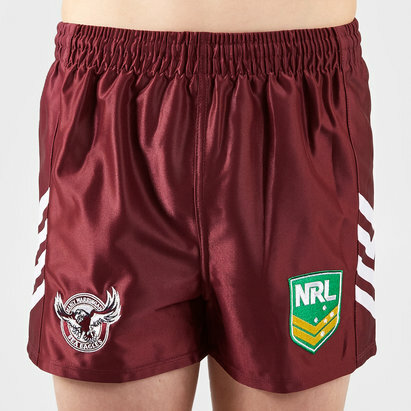 Cheer on the Silvertails in the 2018 NRL with these Manly Sea Eagles NRL Kids Supporters Rugby Shorts from ISC. The Manly Warringah Sea Eagles play their rugby in Austalia's premier rugby league competition, the National Rugby League NRL. Since winning their first premiership in 1972, the club has won a total of eight First Grade titles, with their most recent premiership being the 2011 Grand Final. The club's eight titles span five consecutive decades. Since their first Grand Final appearance in 1951, the club has appeared in 19 Grand Finals across seven consecutive decades. The club has never won the wooden spoon in its 70 seasons, the longest period of any current club. Upon entering the NSWRL, Manly took on the colours of maroon and white. These were adopted from the colours of the President's Cup side who wore the colours of the local Freshwater Surf Lifesaving Club, which was previously established in the area in 1908. Manly Warringah chose the sea eagle – the native bird of prey on the Sydney coastline – as its emblem. Just like tradition these shorts are predominantly white with maroon detailing down the sides. The NRL logo is on the left whilst the club badge is on the right.